Diabetes in cats is a condition arising from insufficient insulin in the cats body. Insulin is an important hormone produced by the pancreas that regulates blood and glucose. When there’s not enough insulin, blood glucose increases to an unhealthy level and might cause some symptoms. 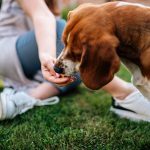 Some of the more common symptoms are weight-loss, increased thirst and urination, abnormal or increased appetite, poor coat quality and general signs of ill health. 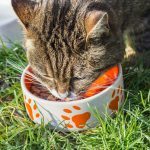 If uncorrected these cat symptoms can progress over days or weeks to include poor appetite, vomiting, dehydration and in extreme cases a coma or even death can occur. Diabetes in cats is usually detected in middle aged to older animals and is slightly more common in males than in female cats. 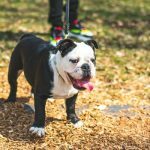 Over weight and inactive pets also have increased likely hood of developing this issue. The number one symptom of the ailment is increased thirst and very frequent urination, which can be caused by other conditions or sickness as well. This condition can develop over weeks or months, and in uncomplicated cases is not an urgent condition. At the time of diagnosis many cats will have been living with it for some time. A cats metabolism has been known to adjust somewhat for the elevated glucose. However, if diabetes in cats is untreated the condition can worsen and can become an emergency or even a life-threatening situation. In these cases the cat will have developed severe symptoms and complications arising from the chronic high blood sugar levels. Death can occur if treatment is not sought out immediately due to damage to internal organs and complications associated with a diabetic condition. Never restrict access to water when a cat has increased thirst. Even if the cat is urinating to excess and wetting in the house. 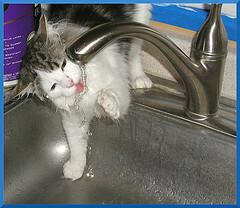 The cat is usually unable to control its thirst and depriving the cat water will cause dehydration. If possible collect a urine sample to take along to the vet. 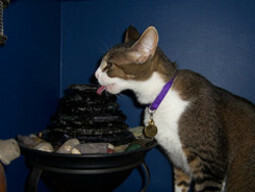 Testing the cats urine can nail down the exact cause of their increased thirst and urination. If these tests prove that diabetes exists in your pet this does not mean the end of the animal’s life. Feline diabetes can be controlled and treated. Unfortunately, no tablet or pill treatment is available at the time of this writing. 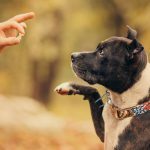 However a pill treatment for humans recently launched, so this might trickle down for pets in the near future. Until then, this means insulin injections will have to be given on a daily basis or at the rate a veterinarian prescribes. The most common problems when treating diabetes in cats is missing an injection and then overcompensating that with an overdose of insulin. There can be outward signs that a cat has been given too much insulin. Shaking or trembling is probably the most common one. If you have found the cat in a trembling or confused state or even collapsed and non responsive you should seek immediate professional support. You must make sure to remember to notify the veterinarian of the possibility that an overdose or under dose of insulin has occurred. Most vets feel the safest course of action in this situation is to treat for an overdose. 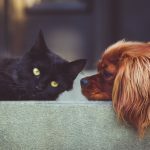 Seeking help for your pet immediately can save their life. When your veterinarian prescribes insulin they will supply instructions for both an under does and overdose condition. But another visit to the vet for a blood test to be sure of the current level of glucose in the cats system may also be needed. Cats adapt well to the daily treatment of the diabetic condition. At first they will protest but they will get used to the injections and allow you to treat them for this condition. When the disease is treated properly a normal life span can be expected. My wife had a cat before we met that developed mild diabetes at age 13 and lived to age 17. That’s a lot of happy years together. Help cat people find this page with a bookmark or share.